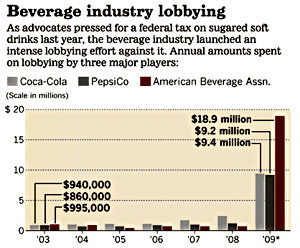 Earlier this morning I posted a chart showing how much money had been spent lobbying against a tax on sugared beverages by Pepsi, Coke, and the American Beverage Association. I just want to make one more point about it. Assuming the LA Times did its sums correctly,1 this is one of the clearest examples you’ll ever see of how much money can be spent lobbying on one specific piece of legislation. Usually that’s hard to figure out, since industries spend a lot of money lobbying all the time, and it’s hard to say how much is spent on one issue vs. another. But for six straight years, these three companies spent about $3 million on lobbying activities. Then in 2009 that suddenly jumped to $37 million. Since there wasn’t much else going on that would have seriously affected them, that means they spent $34 million just to defeat the sugar tax. For comparison, that’s nearly as much as the entire aerospace industry spends on lobbying for the entire defense budget each year. It’s five times more than the sugar lobby itself spends lobbying on all sugar-related issues each year. It’s about as much as organized labor spends on all lobbying activities for everything. That’s the kind of muscle that the business community can bring to bear when it cares to. As much as the entire annual lobbying budget of organized labor or the aerospace industry, all for one single piece of legislation that never really had a ton of support in the first place. That’s a lot of leverage. 1The caveat here is that the Times used CRP figures for 2003-08 but its own research for 2009. So it’s possible that the comparison isn’t apples-to-apples due to different methodologies.